The Audi A4 seats five and comes standard with a turbo-charged 2.0-litre four-cylinder engine, a continuously variable transmission (CVT) and front-wheel drive. All-wheel drive, a six-speed manual transmission and an eight-speed automatic are available. 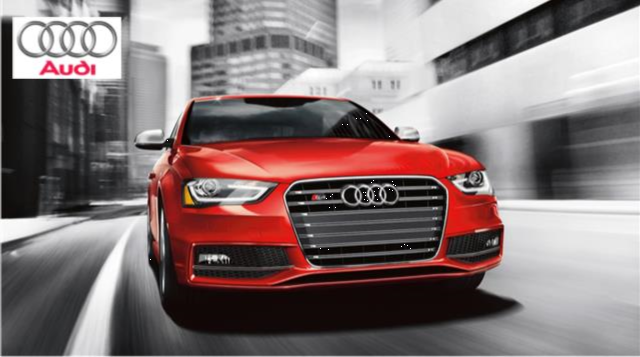 The A4 comes in Premium, Premium Plus and Prestige trims, while the performance-oriented S4 comes in Premium Plus and Prestige trims. The A4 hasn't been fully re-designed since 2009. ·A higher boot lid on the sedan. The new A4 has grown in size, has a 120kg weight reduction, as a result of the hot-formed high-strength steel in the body structure and aluminium being used for body panels and the roof. ·Tablet-based rear seat entertainment and the latest version Multi Media Interface (MMI) system that features an internet connection. Audi's new 'Pre-Sense City System' with windscreen camera to monitor the road, which provides an acoustic warning and braking at speeds up to 25mph. The new A4 now has a choice of three turbo-charged four-cylinder petrol, two four-cylinder diesel and two V6 diesel engines, all featuring EU6 emission compliance. ·A new 1.4-litre four-cylinder petrol engine (replacing the 1.8-litre four-cylinder petrol engine) and can accelerate from 0-100kmh in 8.9 seconds realising a top speed of 210 kmh with combined consumption of 4.9 Litres/100 kms in combination with the optional S tronic dual-clutch automatic gearbox. ·Also Audi's familiar 2.0-litre four-cylinder unit. The former provides 0-100 km/h acceleration of 8.6sec and a 220 km/h top speed. The latter boasts an official 0-100 km/h time of 7.7sec and a 236 kmh top speed. ·Rounding out the new line-up is a 3.0-litre V6 diesel. Front-wheel drive is standard on all models save for the initial range-topping A4 3.0 TDI. Four-wheel drive is also optional Gearbox choices include a newly developed six-speed manual on all four-cylinder engines. Seven-speed dual-clutch S tronic unit is available for the first time on front-wheel drive A4 models and comes as standard on the least powerful of the two 3.0-litre V6 diesels. The more powerful 3.0-litre V6 diesel engine receives a standard eight-speed automatic featuring a coasting function that idles the engine on a trailing throttle for added fuel saving.